When I saw this pic, I had to bring it to the attention of Oldest Junior Hall and give him a little comeuppance. As you may recall, he spent a year or more in New Zealand and now he’s back and not a day–not one single day–goes by that OJH doesn’t find a way to bring NZ into the conversation and remind us all how cool he is, just because he went to NZ. Well, honestly, no. I can’t believe that anyone could live their entire lives without eating raw chocolate chip cookie dough. It’s kinda unfathomable to me. And then I remembered these truly awesome photographs of all these indigenous people (by photographer Jimmy Nelson who may have taken the picture for that meme, come to think of it) and figured there are probably all kinds of people all over the globe who haven’t had this delicacy. Or might not even consider it a delicacy. Anyway, I thought you might enjoy seeing their pictures because these cultures, these tribes, are passing away. 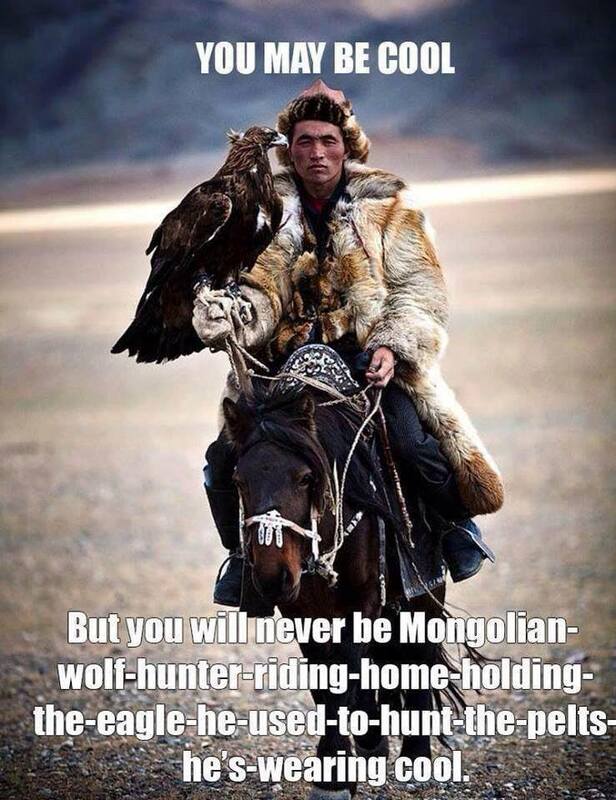 And though the world could make do without chocolate chip cookie dough ice cream, I think we’d sorely miss a truly cool Mongolian wolf hunter. There is a half tube of chocolate chip cookie dough in my fridge…it has never seen an oven. 🙂 And the Mongolian wolf hunter IS way cool, as is OJH—he lived his dream, baby!—even though his mama might be a little tired of being reminded of it. And now I’m off to follow the links! Can you believe that there are millions of people around the world who don’t eat cookie dough? Who think it’s disgusting? It boggles my mind. It’s amazing how superior our kids are to us, and how us old folks–as inexperienced and clueless as we are–manage to survive without constant reminders and tutelage from our kids. Ask your NZ expert. I’m sure he knows it all.